We have chosen our next Old Ducks Bookclub book. Cloudstreet by the Australian writer Tim Winton. I am looking forward to getting stuck into a book again. Even though I claim to be time poor, if I am reading a good book I always seem to make the time to sit and read a chapter at some point in my day, maybe by running around a bit more efficiently in the morning or choosing the book over TV in the evening. I just love my local library. I really think they are an undervalued service. If I had to buy books I would find it hard to justify the purchase on a week that already has a list of things needing to be bought for the house or the kids. This way I get some "me time" at no cost. I put my request in on-line one afternoon and the next day got a text confirming my book was ready to be picked up. A short walk on my lunch-break and I am filled with the anticipation that comes at the beginning of every book. I haven't even read the back cover and have no idea what lies inside its pages. Time to put on the kettle and see...! Today is Mothers Day in Ireland and the UK. It's easy to slip my mind over here in Australia with our Mothers day being later in the year. No commercial signs and banners as you walk through the shopping centers. It's up to my trusty calendar to remind me. The card was made a couple of weeks ago but then I missed my opportunity to get it in the post at the right time and now I'm just crossing fingers and toes in the hope it will arrive on time. Happy Mothers Day to all you wonderful ladies on the other side of the world. To my Mother-in-law who I thank for my wonderful Mr B. And of course my own lovely Mum who will always be the "Best Mum in the world" to me! As a kid I loved reading books like Mallory Towers, the adventures of girls all living together in dorms and having midnight feasts and wonderful adventures. One of the highlights of the boarders week was when they would get a parcel from home filled with treats and letters. We know of a few families whose children are currently at boarding school. Some in the UK and some here in Australia. Now kids have access to mobiles and emails it is not quite the old fashioned world the children's books described. Families can send and receive messages over breakfast. No longer is the arrival of the postman a hold-your-breath moment as you wait to see if a special letter or parcel has your name on it. Recently I found an interview in a magazine that I thought a friends son would be interested in. He is one of the kids we know who boards. The idea of sending him just the page in an envelope seemed a bit of a lost opportunity. Initially I grabbed a bag of lollies and threw them in the family shopping trolley thinking that it would be nice to put them in the envelope with the interview. Then the woman in the post-office explained that the minimum parcel size meant that the postage would be triple the price of the bag of sweets. There was only one thing for it. I was going to get every scrap of value out of the parcel weight allowance. I got a small box and threw in the lollies, then bar after bar of chocolate, a new block of Dairy Milk (that the check out woman told me was the most addictive treat she had ever eaten!) And of course the interview that had started the whole ball rolling. It felt like I was a character in the old Mallory Towers book as I wrapped my parcel in brown paper and tied it with old fashioned butchers twine. I'm so excited about going down to the Post Office and sending it on its way. If he gets half the fun out of opening it and eating and sharing the treats inside then it will have been worth every cent! Gareth had a school project to do this week. It involved making a "Biome" of his choice and researching it and making a 3D model in school. I offered to be an extra pair of hands in the classroom that morning and it was a chaotic mix of laughter, sticky tape and kids all over the floor with glue pots and glitter. I don't know how teachers cope with that 5 days a week. They deserve sainthoods! Gareth choose the biome of The Great Plains of Northern America. He had buffalo, hawks, prairie dogs and pronghorn, play-do Rocky Canadian mountains to the west and the Mississippi river to the west. All nestled in a cardboard box with some dry grass stuck to the bottom that he picked off the patio the day before. He was really proud of his finished product. I said goodbye at this stage and went home for a well deserved cuppa. When Gareth got home later he was so excited to tell me all about his afternoon. He had to give a speech on all that he had learnt and said it went really well. I'm hoping that this love of learning will continue to be a part of him as he grows up and maybe some day he may even find himself lucky enough to travel to the places he has learnt about in school. Watermelon was down to 45c per kilo at our local supermarket this week. We picked up a huge Melon and put it on the scales and worked out that all 7 kilos of it was going to cost less than the price of an ice cream. Rhiannon asked could we buy it so she make a melon basket out of it? Here she is just starting to carve it out. We had great fun and by the time she cut out the inside and mixed the chunks with other fruits and put them back inside we had the biggest fruit salad I had ever seen. And we still have a couple of monster wedges of melon in the fridge to eat later! We forgot to take a photo of the finished masterpiece. You will just have to trust me that it looked (and tasted) amazing! Some beautiful daisies I saw on a walk. And yes, I might have been a little out of puff and bent over double when I saw them. Stopping to take a photo was a handy way to let me catch my breath again! 25:03:14 Last year at Primary. I can't believe that this is the last year I will have a child at Primary School. I'm so not ready for Gareth to move up to High School. I thought it was scary having Sian move up and I was convinced she was going to find it a hard transition. She didn't. Then Rhiannon moved up and I thought the same. She has coped fine. And now Gareth, my baby, is in his final year in Primary. I am grabbing every opportunity to go into school and help with reading, with craft days, sitting in on presentations and assemblies. I'm really going to miss this school. We had our first meeting tonight in the High School outlining the coming months and how the transition would work. But then they gave some great advice to the kids. Enjoy year 6. Don't spend year 6 thinking about year 7. Just enjoy it. I think that advice applies equally to us parents. Just enjoy it. And so I am! My sister is younger than me. My sister just ran a 5k event. She told me all about an eight week "walking to running 5k" programme you can do. I listened to what you need to do on week one, session one and then tuned out the rest of the conversation as I pictured myself running gracefully in slow motion, looking happy and glowing with health. In my head I looked 10 years younger and had glossy locks tied back in a pony-tail that bounced gently as my feet barely touched the tarmac. Well number 30 was one of the things that many people wanted to know more about. I am really excited to share that not only was I the lucky recipient of one of the first plain cover bound editions of the book but since then the book has actually been published for general public sale with glossy gorgeous proper cover art. I'm so proud of my friend. She is a member of our small Old Ducks book club and at our last meeting we knew she would be bringing a box of the first commercial copies of the book. I wanted to show her how excited we were and all I could think of doing was making cupcakes, but not just plain ones, they had little cake toppers with a part of the books front cover printed on them! It was so much fun sharing her excitement. She was like a glass of champagne that fizzes up and overflows. Her face was literally sparkling with animation as she filled us in on the exciting journey of seeing her book go from rough draft to finished product. She has a proper website with information about the book and ways you can buy your own copy. I'd love to write a proper blog post in the near future when I have all the correct links to share with you. I even think there may be an official book launch at our local library and of course if you are living in the area I would so love to encourage you to come join us celebrate the success of someone who has worked so hard to follow her dreams! My fortune cookie message. Very true so far and hopefully more to come! The first strawberry from our veggie patch. Tiny but packed with flavour. I found it one evening as I was nearing the end of a fast day. I had already reached my calorie intake for the day but out of curiosity I weighed it and used Calorie King to work out its calorie content... 1 calorie! A no brainer. It was mine! Yum! Having fun after our little nephews in Sydney asked us to try to do the "Magic spoon" trick via a video. Much fun and laughter was had as we made our own video to send back! Today we wave goodbye to our two lovely Japanese students. Our family has grown by two more kids. I am sure we will keep in touch via email once they are home. We are even joking to one of the girls that when her 12 year old brother has his Australian trip in a couple of years he might choose us as his host family. Enjoy your two days in Sydney and cherish returning home to your families. I'm sure they have missed you. We hope they enjoy their TimTams and Twinings Aussie afternoon blend tea. I will forgive them if they don't love the jars of Vegemite. I am still laughing at you trying it on crackers, liking it, and then jumping into Byron's car for a last minute dash to the local IGA so he could buy you some to bring home. Thank you for our Japanese photo frame and we will always remember the madness of running barefoot across the reserve at 7.30am with tripod and camera to set up our group photo in the beautiful golden light, lake shimmering behind us and wet grass beneath our feet. The battery died just after taking this lovely photo. We hope you enjoy the album we put together for each of you to relive your favourite moments and that it helps you to tell the story of your Australian adventure to your families on your return. 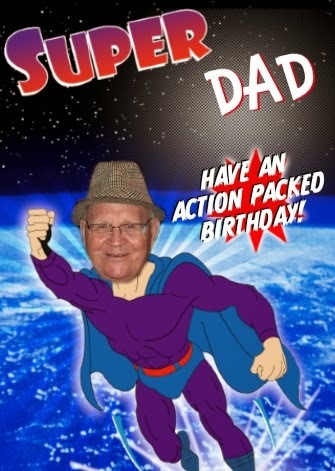 Happy Birthday to my Father-in-law Den. If Mr B is a Super-Hero in his kids eyes then you must be the Father of all Super-Heros! Have a great day and try to find some time to relax after you have finished saving the world! I don't often let myself get on the other side of the camera. I love when fellow bloggers put images of themselves up. It helps to put a face to the words that they write. So here is a photo of me today. Celebrating St Patrick's Day with a dinner of Beef and Guinness casserole, seasoned mashed potato and green peas with a pastry shamrock on top (and a couple of baby shamrock pastries from the off cuts) I'm wearing a daft "Irish Princess" crown given to me by my friend Julie, little emerald earrings given to me by my in-laws and the Irish rugby top I bought when I was home a year ago. I've always said it's the little things that make us laugh, that make an average life into a brilliant one. Whatever little thing it was that had me laughing is lost in the muddle of laughter that rang around the table as we ate together, Welsh, English, Irish, Australian and Japanese. A mixture of cultures and personalities all come together to celebrate everything green. Happy St Patrick's Day to you all. This mad Irishwoman is off to bed! 16:03:14 Framed on the beach! Pinterest is a marvelous thing! I typed into it "Beach photo ideas" and up came some amazing, fun beach shots that were just a simple twist on a regular pose. One of my favourite ideas I saw was to use an empty photo frame in the foreground with your subjects "framed" further back. We grabbed 5 mins on Nobby's beach after a massive downpour and had a go. The first attempt involved me running to the waters edge and lying flat on the ground with the frame in my outstretched left hand and the camera in my right. I had Byron and Gar running towards me but then also one more unexpected person, the Lifeguard! He wanted to warn us not to swim as there was a crazy rough swell. I think he thought I'd been on the Guinness lying flat on the sand as the waves broke just a small away from me! Today we packed a lot in! We started with a breakfast of rock-melon, water-melon, bircher and nutella spread croissants. Then we packed up a picnic and went to Blackbutt Reserve to see the Koalas and Kangaroos. We fed the Emus and saw some blue tongue lizards and some beautiful peacocks. Luckily there was one beautiful photo of the girls on the beach that won hands down as the best photo of the day! I made sure the girls were happy with me sharing it with you. This is a photo that sums up the fun and the excitement of the day. Blue skies, warm golden sand and big smiles. We will sleep well tonight! Our gorgeous Japanese girls arrived today. They are full of giggles and half spoken half gestured conversation! They have brought little gifts with them, Japanese fabric, wooden toys and canisters of green tea. 13:03:14 Ready for our Japanese students. Tonight we go to bed excited about the arrival of our two Japanese girls tomorrow. They are visiting St Paul's in a group and will be staying with pupils in their homes as a way to experience the real Australia. This is our fourth year to host students. Every year we make wonderful new friendships and learn a little more about a different culture while hopefully sharing a bit of our culture with them too. We have the spare bedroom all ready and have bought some little treats for them. Safe travel girls. We cannot wait to meet you! We are about to start a new chapter in our parenting journey with Sian successfully sitting her theory driving test and passing. She now has a learners licence and has 120 of driving to do before she can sit her practical test. Over to you Mr B! I thought you might enjoy seeing a little picture of my not-so-successful baking from the weekend! When I checked the oven and let out a scream Byron came into the kitchen speaking words of comfort "I'm sure they're not that bad" Then he saw them and was speechless! I used a knife to cut around the sides and slice off the tops, I sat them inside a fresh spotty cup-cake case and drizzled them with lemon icing. The kids named them "ugly cakes" but the next day I enjoyed eating all the scraps for morning tea and they actually tasted yum! We had so much fun this weekend. In between studying for an exam there was time to laugh, blow out the candles on a Malteser cake, eat macaroons and spend time chilling in Merewether surf house. A weekend of celebrating our gorgeous first born! There are some numbers that evoke a certain memory. When you see them in another context they can transport you to another place, another time. On a walk recently I saw this fence. On it the number Ninety Eight. The years whizzed backwards in my head and I was transported to 1998, the year I became a mother. In March 1998 I was ready to give birth to my first child. We were so excited. The nursery was ready, the changing table all set out with nappies and creams. The little baby vests washed and folded and waiting to be worn. All we needed was to tell this baby to hurry up and meet us. And on the 9th of March she did just that. After hours and hours of slowly progressing I began to push. And then it happened... One minute it was Byron, the midwife and myself, the next there was a baby in the room. I still remember the astonishment as I saw her. A baby. A real baby. My real baby! Sian, you came into our world and made it a better place. For 16 years we have watched you grow and we have learnt how to become parents. We haven't always got it right and I'm sure we still have more to learn but we are so incredibly happy to have you as our daughter. We want you to grow to become a happy and well adjusted individual. Although I am tempted to hold you tight and wrap you in bubble wrap I really do want you to get out there and experience life in all its glory. These next few years you will finish school and make a start on your adult life. You will rely less and less on us and start to trust in your own beliefs. You will make friends and lose friends. You will discover the person you are, truly uniquely you. There has never been another you and there never will. Stand proud in front of the mirror. Take a deep breath and pull your shoulders back, hold your head high and give your best smile. You are wonderful just as you are. For some you will not be important as we cannot be friends with everyone no matter how hard we try. But for some you will be their whole world. Be the best friend you can be and spend time with those who make you feel good about yourself, those who make you laugh and bring out the best in you. Eat foods you have never tasted before, accept opportunities to try new things, go new places, aim high but don't worry if sometimes you don't reach your goals. Everything happens for a reason. There is a big picture and it is being watched over by powers greater than you. Trust in your heart and know that you have a cheering squad shouting and clapping for you in the background. A cheering squad made of Your Dad and I, your brother and sister, relatives, teachers and wonderful family friends that will try to allow you to make your own mistakes and learn from them but a cheering squad that will circle you and lift you up at the smallest sign that you need us. This weekend we had a beautiful friend of Sian's visit. Sian has missed her since she moved away from our area. Despite the distance they have kept in touch and this weekend they had fun just being together, shopping, chatting and catching up. Even waiting for the train to take her friend home they talked and laughed right up to the moment she had to board. They pretended to be annoyed as I acted like a paparazzi and took loads of photos. Despite them pulling silly faces in most of them I knew if I took enough there would be "the one" that would catch the moment. Catch their friendship and their laughter in a single second of time. Freeze framed and perfect. We had a big Mexican meal out tonight to celebrate Sian's upcoming 16th birthday! I left my phone on our table as I went across to another table to say "Hi" to a friend I hadn't seen in years. When I returned it was to find A LOT of selfies on it taken by Byron and the kids. This was my favourite! A bit blurry but it captured the fun we were having!!! I went for my first lunch-break walk today in ages. The aussie weather has just been too hot recently and if I walk at lunch I get back on the ward sweating. Even though I change into sports clothes to walk I just feel so sticky when I get back into my uniform afterwards. Now that Autumn has arrived I am looking forward to more days like today. Warm but not too hot. Walking away from the hospital and down by the lake for my precious 30 minute break is a good way of distracting myself away from a grumbling tummy on a fast day and a great way to shake off the stress of the busy ward and return refreshed and ready to get stuck in to the last part of my working day. Wilma pecked my feet constantly this evening as I un-pegged the washing from the line. Then I went and checked for eggs and found one lovely perfect one. She strutted around and around the laundry basket like a complete show off and then started to pull the socks out and throw them on the grass. I decided to quit while I was ahead and go back inside, precious cargo tucked in amongst the clothes! Today was spent with my favourite 2 year old, my beautiful God-daughter and her sister. We baked and iced cup-cakes and made a Cafe sign for the front door ready for Mum's return. Then we played with my old doll and wrapped her in a rainbow blanket and sat reading Mr Men books together. The excitement when we heard mum's car pull in to the driveway was jump-up-and-down-on-your-tip-toes! We had laid the table with the poshest cups and saucers and arranged our sticky sprinkled cup-cakes on a three tiered plate. We sat and had afternoon tea together with the two little ones having iced water in their tea-cups to play along. A beautiful day. These are the days that I will look back on when I am old and grey. The days that housework waited in the background and fun and mess making took priority. The days that make life rich and my heart sing. Here is the recipe I loosely base my "Dragon Pie" on. I'm not a fan of step 3 where you throw away the veggies. After my big Monday supermarket shop I just sear the meat, chop the veggies and add the Guinness and pour it all into my slow cooker casserole dish and keep it in the fridge until the day we want it. Then I cook it on low for 8 hours and serve with the mashed potato and steamed veggies. It's a great recipe to make a double batch of and freeze half the casserole for an easy dinner later in the month. Don't forget to make pastry "lids" with a sheet of frozen puff pastry. Simple squares to sit over the meat when served up on a normal day, a Welsh dragon cookie cutter for St David's day and a big shamrock one for St Patrick's day on March 17th! Happy St David's Day everyone! March 1st marks the first day of Autumn and the feast day of the Welsh Patron Saint David. A day where all Welsh people celebrate their nationality and eat foods that remind them of home. We started our celebrations with mountains of Welsh Cakes made from a recipe book given to me by Byron's mother. Our main meal of the day was our traditional "Dragon Pie" A Beef and Guinness casserole which had been marinating since Monday and then slow-cooked over the day. Seasoned mashed potato and steamed veggies on the side and topped with a pastry dragon. Recipe is here. Many people have asked me where I got the pastry dragon from. I bought a cookie cutter online a few years ago and it has been invaluable. You can find them easily enough by clicking here. It's worth doing a bit of looking around to find the stockist who will post it to your corner of the world and seeing what the total cost is. I think I paid almost as much for delivery as the cutter itself but it will get many years of use in our house so it was worth every penny!